As clean-up of the damage done by Hurricanes Rita and Katrina has begun, Texas horsemen have stepped up to the plate to lend their helping hands to fellow horsemen impacted by both hurricanes. Not only have the horsemen of Texas stepped up to help fellow horsemen and their horses, but so have the racetracks, racing associations, some state agencies, and national racing organizations with which the Texas Horsemen’s Partnership (THP) is affiliated. Many THP members and employees have given generously of their time and resources to help in these efforts. Hurricane Katrina did a tremendous amount of damage to Louisiana, Mississippi and Alabama, and Hurricane Rita was expected to do the same in Texas coastal areas, including Houston and Galveston. 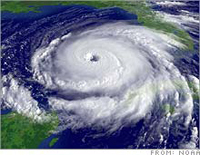 Fortunately for the greater Houston area, Hurricane Rita was downgraded to Category 3 status and made its major impact on East Texas and Louisiana. Sam Houston Race Park, located 60 miles from Galveston, sustained relatively little damage from Hurricane Rita. Some tree limbs fell, a section of the valet oval cover was destroyed, and there was no electricity for approximately six hours early on the morning of September 24. While flooding was rampant in Beaumont and Louisiana, Sam Houston Race Park had less than one inch of rainfall from Friday, September 23 through Saturday, September 24. The response from Texas horsemen and the Texas racing industry to Hurricane Katrina and then Hurricane Rita was swift and considerable, coming from individuals, organizations, racetracks and state agencies. Texas Thoroughbred Horsemen’s Benevolent and Protective Association (TTHBPA) Director Tom Durant pledged to match any donations raised by his employees at two car dealerships he owns - Classic Chevrolet and Classic Hummer. Those employees came through in a big way, and on Thursday, September 8, Durant, surrounded by many of his employees, handed over a check for $85,300 to the Salvation Army. Texas Thoroughbred Association (TTA) Director Robert McNair and his wife, Janice, gave $1 million. The McNairs operate Stonerside Stable and also own the National Football League (NFL)’s Houston Texans franchise. TTA Director and Thoroughbred Owners and Breeders Association (TOBA) Chairman Bill Casner and his wife, Susan, made a commitment to match up to $1 million raised during the Keeneland September sale. Casner is the co-owner of WinStar Farm near Versailles, Kentucky. Texas’ three Class One racetracks – Lone Star Park at Grand Prairie, Retama Park, and Sam Houston Race Park – reached out to offer their assistance to those impacted by Hurricanes Katrina and Rita. Lone Star Park at Grand Prairie - On September 24, the Lone Star Park Charitable Foundation for Grand Prairie spearheaded its first Volunteer Day so Grand Prairie and area residents could devote their time to assist moving furniture to the new residences of Hurricane Katrina evacuees that had been staying in Grand Prairie shelters and hotels, as well as helping facilitate their everyday needs; clean-up work at the Grand Prairie YMCA, such as installing new benches and painting; and planting new trees in the community to develop a tree farm near Dalworth Park. In addition, Lone Star Park at Grand Prairie opened its stable area to accept racehorses of all breeds seeking refuge from Hurricane Rita. Retama Park - Friday, September 9, was Hurricane Katrina Relief Drive Night at Retama Park. The drive was designed to aid victims evacuated from their homes due to Hurricane Katrina and relocated to the San Antonio area. Retama offered patrons who brought relief items free admission for the evening. Items collected included baby food and baby products, canned formula and diapers, canned food drinks like Ensure to help the elderly and sick, personal hygiene products for men and women, and cash donations. Sam Houston Race Park - On Labor Day, Monday, September 5, Taylor Anne Van Bebber, the 7-year-old daughter of leading Sam Houston Race Park trainer Janet Van Bebber, sold her artwork to benefit the victims of Hurricane Katrina at the Houston racetrack. The aspiring artist wanted to show her support to aid in relief efforts for the many residents of our neighboring states of Louisiana and Mississippi. Patrons responded by donating $1,075 throughout the day. Sam Houston Race Park matched all contributions generated from Van Bebber's artwork and donated a check for $2,150 to the American Red Cross. Sam Houston Race Park also continued to assist with Hurricane Relief fundraising efforts through the end of its American Quarter Horse meeting, which concluded on September 11. In addition, Retama Park and Sam Houston Race Park have offered to help find jobs or employees of Fair Grounds and horsemen who were displaced by Hurricane Katrina. Many Texas horsemen have generously opened their properties up to accommodate horses evacuated from areas impacted by Hurricanes Katrina and Rita. Some also helped search for and rescue horses left behind as their owners were forced to evacuate without them. Habitat for Horses/Lone Star Equine Rescue organized a massive relief and rescue effort to help the equines of southern Louisiana after the devastation of Hurricane Katrina. Volunteers from Texas and Oklahoma gathered at a central staging area and proceeded to the designated sites in Louisiana. From that point, trained rescue volunteers proceeded to any location where horses had been spotted and attempted to extricate and transport them to safety, where they received medical care from the Louisiana State Veterinarian Office. All efforts were made to contact the owners. If contact could not be made, the animals were transported to another location for recovery. As Hurricane Rita passed through Texas, agricultural-related agencies and associations teamed up in support of Governor Rick Perry's Division of Emergency Management to address animal and livestock rescue, and recovery and disposal of carcasses. “In preparation for Hurricane Rita, hundreds of sites, such as livestock markets, arenas, fairgrounds, kennels, individuals and veterinarians sheltered evacuated pets and livestock. Information on sites is provided by the Texas Animal Health Commission at 1-800-550-8242, and the full list is on the agency's website at www.tahc.state.tx.us. Now we and our partnering agencies and associations are focusing on animal rescue and recovery in damaged and flooded areas,” said Dr. Dee Ellis, assistant executive director with the Texas Animal Health Commission (TAHC). Dr. Ellis said the partnering groups include the U.S. Department of Agriculture's Veterinary Services, Animal Care and Farm Service Agency, and Texas' Department of Agriculture (TDA), Cooperative Extension Service, Parks and Wildlife Department, and Commission on Environmental Quality, Department of State Health Services (Zoonosis Control), as well as the Texas Federation of Humane Societies and American Society for the Prevention of Cruelty to Animals. He said Texas Animal Control officers, the Texas Veterinary Medical Association and contacts in Louisiana and Arkansas also are team partners. The TDA has a Hay and Grazing hotline, so producers can find lease pastures or hay. Information can be obtained from the TDA toll-free at 877-429-1998, or on the TDA's website at www.agr.state.tx.us in the Producer Information section. AQHA - The AQHA is teaming with the American Horse Council Foundation to raise funds to help horses and their owners who were affected by Hurricane Katrina. The proceeds of the AHC Hurricane Relief fund will assist horse owners and their horses. The American Horse Council Foundation, under the leadership of its Board, will determine where the funds will best be utilized to help these people and animals in need. Currently, three AQHA Past Presidents serve as AHC Board Trustees. Already, the American Quarter Horse Association had established an emergency relief network comprising AQHA members in dozens of states who are set to accept refugee horses, provide transportation to help move horses out of ravaged areas, provide veterinary services or assist with rescue operations. The American Horse Council Foundation is a non-profit 501(c)(3) organization. Contributions to it are tax-deductible as charitable contributions. If you have any questions or would like to make a donation, please call the American Horse Council Foundation at (202) 296-4031 or send your donation to American Horse Council, 1616 H Street NW, 7th Floor, Washington, DC 20006. National HBPA - The National HBPA website (www.nationalhbpa.com) now features an information center through which horsemen, donors and others who wish to assist can leave e-mail messages. This has allowed the National HBPA to efficiently collect and distribute information on: donated lodging for horsemen and horses; information on how to make donations; Louisiana HBPA’s operations and updates. This has also served to help the National HBPA link missing horsemen with the Louisiana HBPA offices. The National HBPA has also added several lines and operators to its emergency toll-free horsemen's hotline 1-866-245-1711. Information on stranded or missing horsemen will be collected and passed along to the Louisiana HBPA or other appropriate agencies. NTRA - On September 2, the National Thoroughbred Racing Association (NTRA) announced the NTRA Charities – Racing to the Rescue Fund, a special division of the NTRA’s nonprofit 501 (c) (3) subsidiary NTRA Charities, was established to receive contributions, 100 percent of which are being passed through to existing charities established to aid in recovery efforts. Contributions can be made via mail to: NTRA Charities – Racing to the Rescue Fund, c/o Bessemer Trust Company N.A., attention Robert Elliott, 630 Fifth Avenue, New York, N.Y., 10111. Wire-transferred funds can be sent to Bessemer Trust Company N.A., Federal Reserve Symbol, ABA# 0260-0875-6, user name: Bessemer Trust NYC-for account NTRA Charities, Inc.-Racing to the Rescue Fund. All contributions are tax deductible. Questions regarding the fund can be directed to the NTRA's Lexington office, (800) 792-NTRA (6872). The NTRA also announced that the 2005 Breeders’ Cup World Thoroughbred Championships, to be run at New York’s Belmont Park, will serve as a platform to raise funds for victims of Hurricane Katrina. Jockeys, trainers, breeders and owners will be encouraged to contribute a percentage of their purse winnings on Breeders’ Cup Day to the fund. The efforts of Texas horsemen and the Texas racing industry, as well as those of the entire national racing industry, are not going unnoticed by those impacted by Hurricanes Katrina and Rita. In fact, the overwhelming response in this time of need has helped fortify the strength of many of those impacted.